Being the MVP doesn’t make you the best player in the league. Kevin Durant was better than anyone else this regular season, but LeBron James, maybe coasting but probably not, is still the superior and the highest standard of excellence in the NBA. Example? 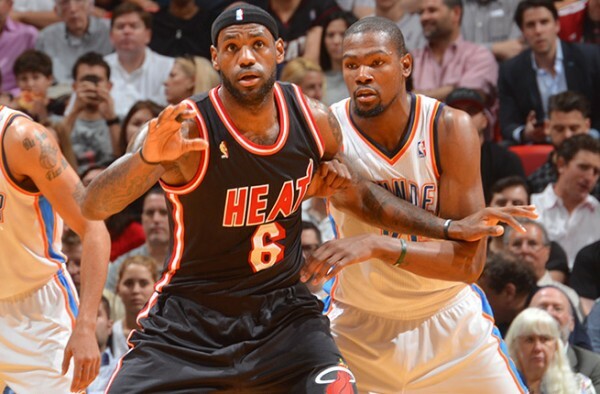 James wouldn’t have had a 6-of-22 game like Durant did in the win over the Clippers. LeBron James scoring 49 points against the Nets doesn’t automatically make him better, and Durant did score some big points in the end to erase some of the ugliness of his shooting performance, but not everything is decided in the fourth quarter. Being excellent before that and leading the team through the first three quarters is just as important. And there’s the all-around thing. 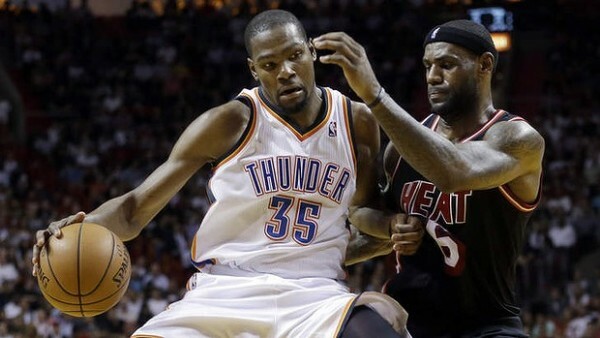 Yes, Durant put up better rebounding numbers than James and has his assists have risen. But James is the better passer, with or without the double teams on him. James is by far the better defender, as a team helper and in one on one situations. Numbers don’t help here. It’s simply a matter of impression and opinion. Kevin Durant might have finally gotten his MVP award, getting validation from the league to being number one officially, but Derrick Rose ended up as the MVP in 2011 and there wasn’t a single person who thought James wasn’t the superior player. He just wasn’t as good that season, or simply wasn’t as loved (the more likely answer) after the Decision. Both players are unguardable without a team effort. Despite this growing myth that’s developed in the playoffs, using a small player doesn’t stop Durant from scoring. It might surprise him, but it takes a team effort, which means doubling him up from the right angles with the right players to put him in tough situations. LeBron James can’t be guarded one on one, not even by Kawhi Leonard. But with a big man shadowing him? That’s the way to do it, or at least limit him. Arguments like this have the championship factor inside them, although rings shouldn’t make a difference. Charles Barkley isn’t an inferior player to Robert Horry. It’s a matter of circumstances and the teams you’ve played for. But James has proven his worth, efficiency and excellence in the toughest of situations and on the biggest stage. Kevin Durant has been up and down these playoffs with a nice scoring average to hide his mistakes. Until we see Durant rise to greatness in the NBA finals or LeBron James beginning to slip physically and as a basketball player, the answer to the question ‘Who is the best player in the NBA?’ will remain LeBron James.